MGM Resorts International is seeking county approval to demolish the defective Harmon Hotel tower, center left, on the Las Vegas Strip. MGM Resorts International wants to demolish a huge Las Vegas luxury hotel that never even opened. The Harmon Building, a condo and hotel tower plagued by engineering problems and cost-overruns, will be imploded because it is just too expensive to fix, according to The Wall Street Journal. It was supposed to be a key piece of The Strip's $9 billion CityCenter project, to be developed by MGM and Dubai World. “CityCenter has decided to abate the potential for structural collapse in case of a code-level earthquake … CityCenter will demolish the Harmon Building,” CityCenter exec William Ham wrote in a letter to Clark County officials. Plans to blow up the building are complicated by a $200 million billing dispute between CityCenter its contractors. The developer says the engineering problems can't be fixed and it shouldn't be on the hook for the payments, according to the Journal. For now, a court order prohibits CityCenter from demolishing the building. The developer is hoping county approval for the demolition will trump the court order. Since construction began in 2008, engineers have found several problems with the Harmon, according to the Journal. The issues arose even as the local economy was cratering, and MGM sought to scale down the size of the building from 47 stories to 27. 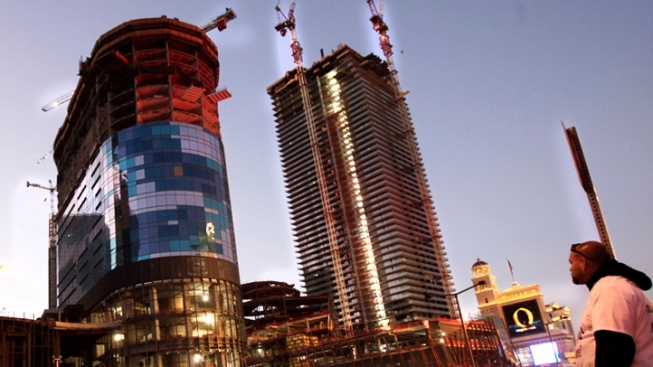 CityCenter opened, but the Harmon, situated on the Strip, remained empty and unfinished. MGM issued a statement saying it would take 18 months just to assess the problems and possible remedies, and implementing them would take years. “The fastest and safest way to resolve public safety concerns created by the structural defect issues” would be to blow it up, the statement said. Contractors charge MGM is overblowing the issues to get out of following through on the project because the market is bad. "Perhaps the implosion of the Harmon could be promoted as an offering to end the curse of this recession," the Las Vegas Review-Journal wrote in an editorial.